If you follow me on Instagram, you’ll know that I have been doing some decorating in the last few weeks. We moved into our home two years ago and had most of the rooms professionally decorated at the time but we left the kitchen and conservatory as they were. I have been using the conservatory as my sewing room for some time but it was a fairly bland magnolia space. 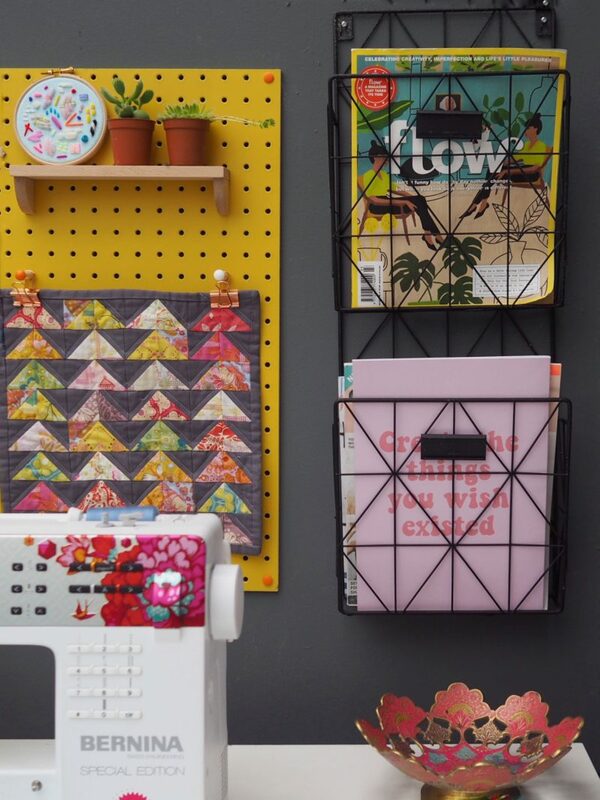 I have been admiring Block Design‘s pegboards for a while and am delighted to have collaborated with them on this project. 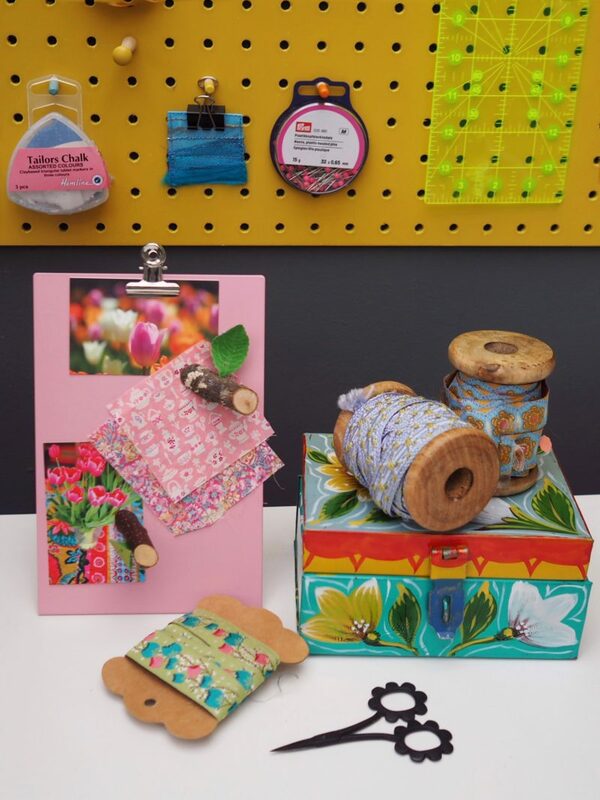 Block Design kindly provided me with several products to decorate my sewing room as well as an amazing giveaway prize for one lucky winner! I painted the walls dark grey (Little Greene Paint Scree) and painted the skirtings and windowsills to match in Eggshell paint. 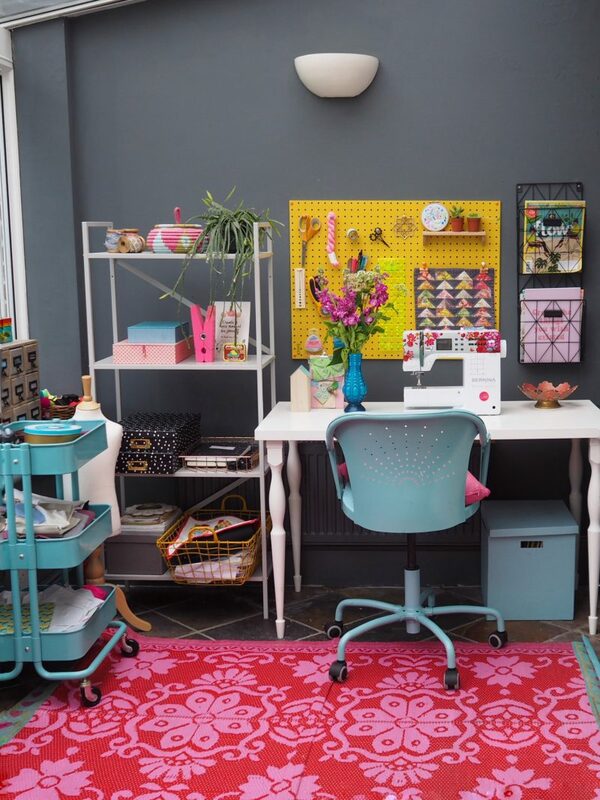 After that it was the fun part – time to get the pegboard up and style the accessories. 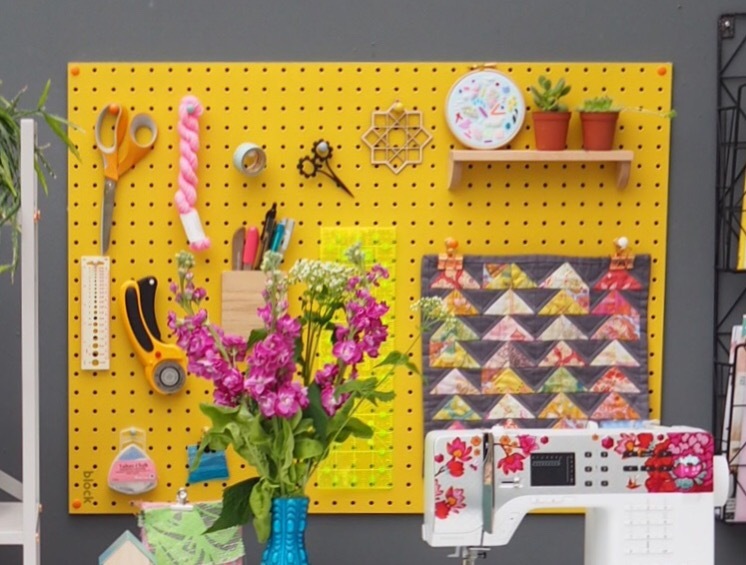 I chose a large yellow pegboard from the Block Design range, which includes three sizes and seven different colours. 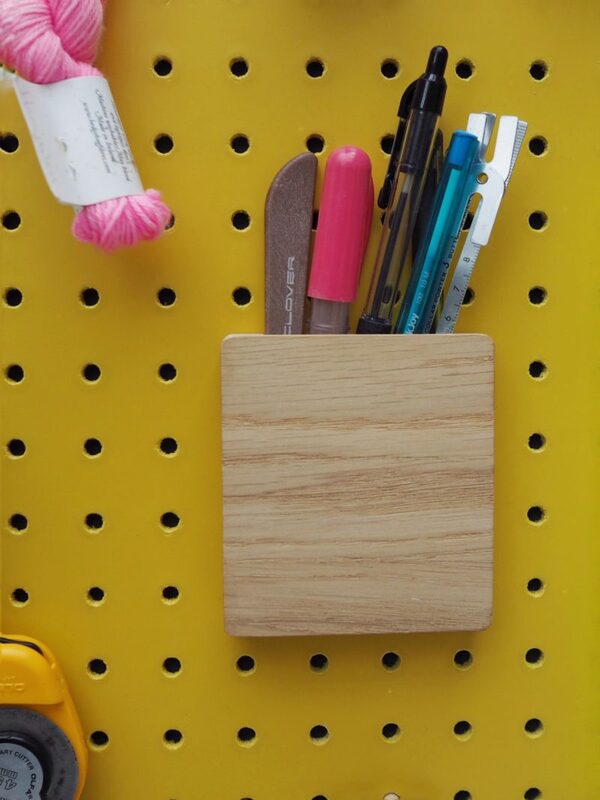 The pegboard comes with a number of large and small pegs in different colours. There were more than enough for my needs but you can buy more in the colour of your choice if needed. 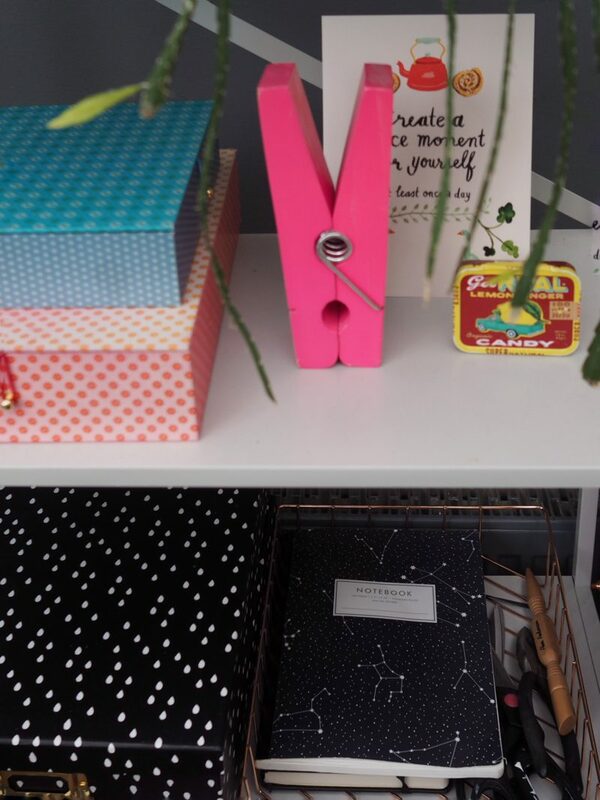 I used these to hang my essential sewing notions, including scissors, rotary cutter, patchwork ruler, tailor’s chalk and washi tape. I also used one of my Bint Khuwaylid stars as a decoration. I found the magazine rack in TK Maxx. It is ideal for carrying some of my favourite magazines and is a good way to display the beautiful covers too. It is screwed into the wall so it’s nice and secure so can carry a fair few magazines! The shelf is one of my favourite accessories by Block. It is very easy to slot into the pegboard and I can use it to display this beautiful hoop embroidery by Elizabeth Pawle which I won during the Spend for Syria auction by The Otto House on Instagram. I made this mini quilt a few years ago using Anna Maria Horner Little Folks voile and Kona cotton. It’s so nice to have it hanging where I can see it every day! The pen holder is another handy accessory which I use to hold my seam rippers and fabric markers as well as pens. 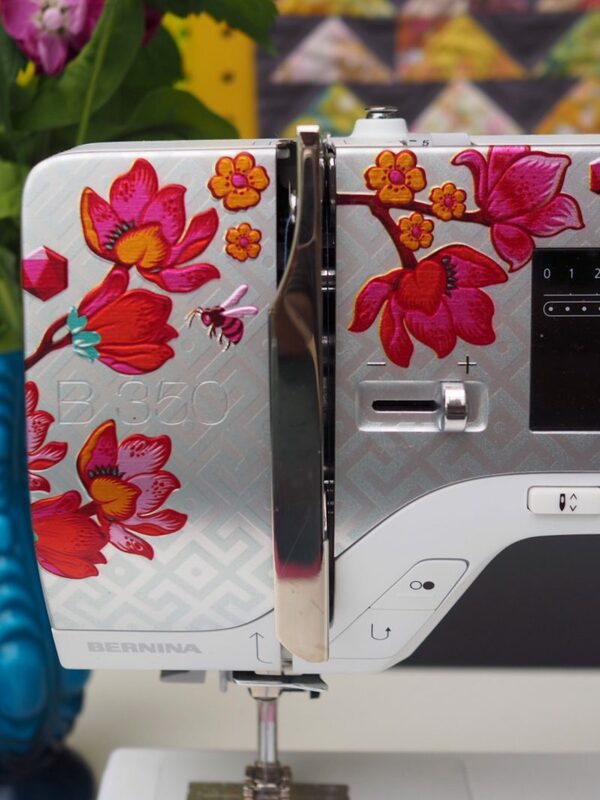 It really makes a huge difference being able to locate my seam ripper at a glance! I am currently using the storage house to hold my extra pegboards and magnets. I bought the twig magnets as part of a set with a wood effect noticeboard many years ago, and think they are quite cute and quirky. 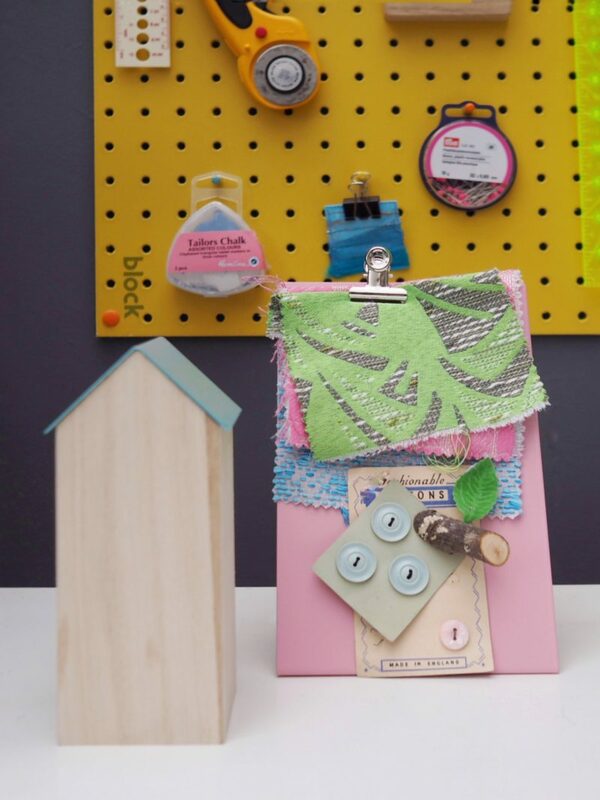 The magnetic clipboard is another desk accessory which has so many different uses. 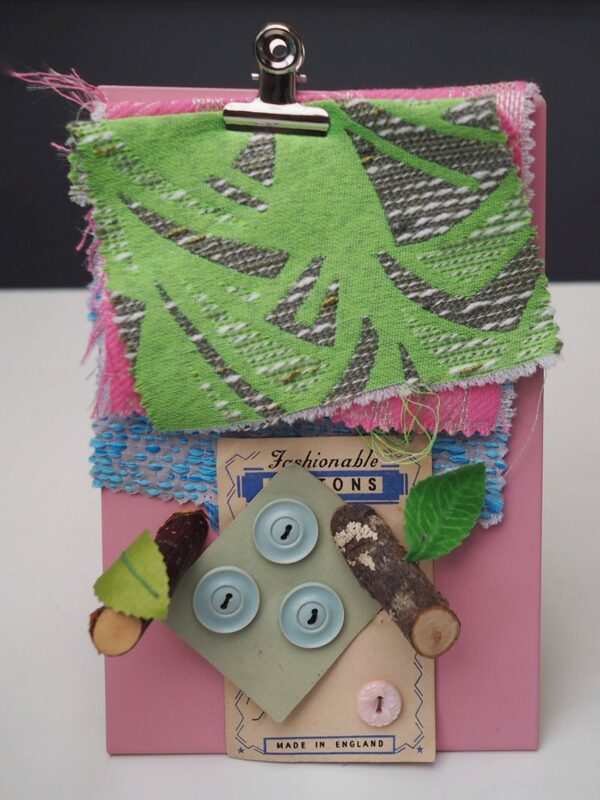 You can use it to hold lists or photos (it fits a 7×5 or 6×4 photo), or as a mini moodboard as I have done above. Here I have swapped the fabrics for some Moo cards I had printed with my photos and some tiny Liberty samples. 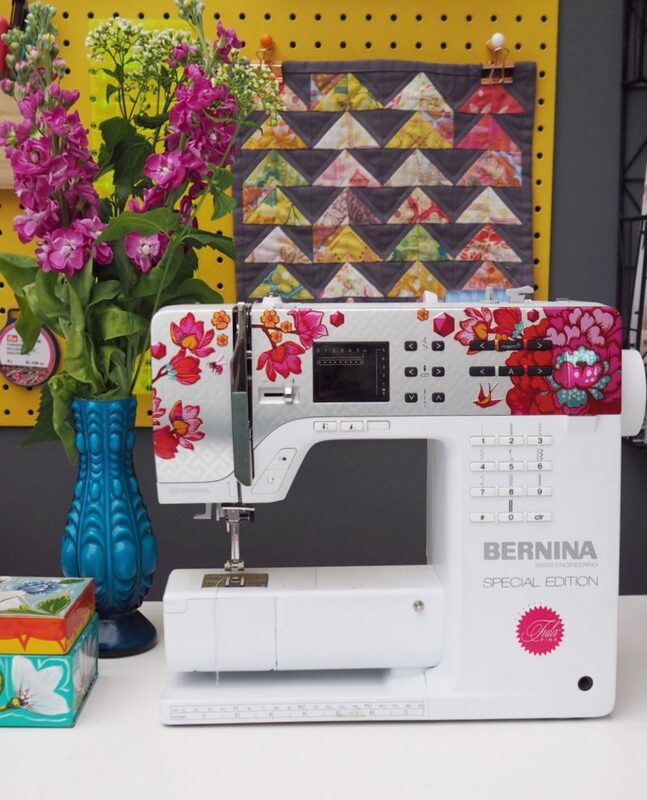 Of course, the pride of my sewing room is my Bernina 350 Special Edition which I purchased a few years ago. I suddenly decided I needed to have one as I loved the Tula Pink design, but by then they were sold out everywhere I called. Fortunately I found one at a dealer not far from me (Deptford Sewing Machines) and have sewn on it ever since. I didn’t really need to buy much for the shelves but mostly styled them with some things I already had. The large neon peg is from Typo It is only available in red or natural currently. I did buy these storage boxes and this copper tray and bulldog clips from Aldi. 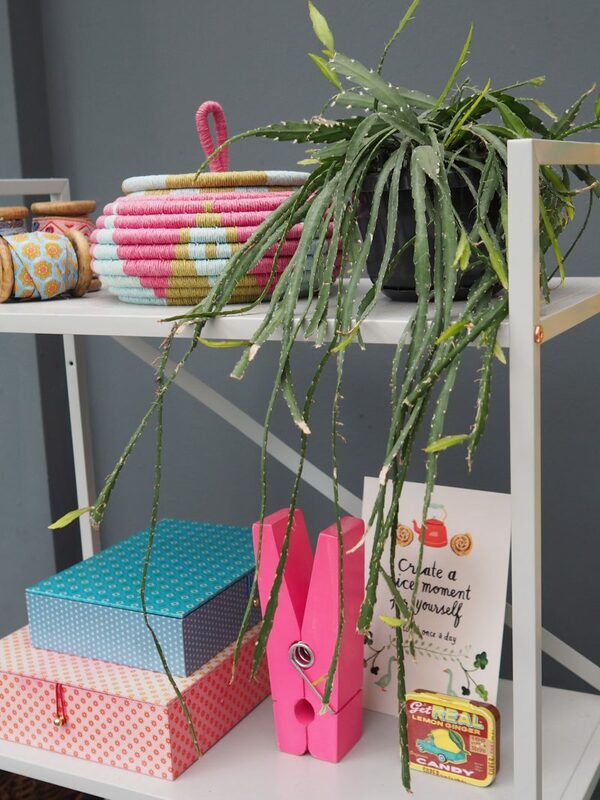 The tray is looking very tidy here but is currently overflowing with cut PDF patterns! 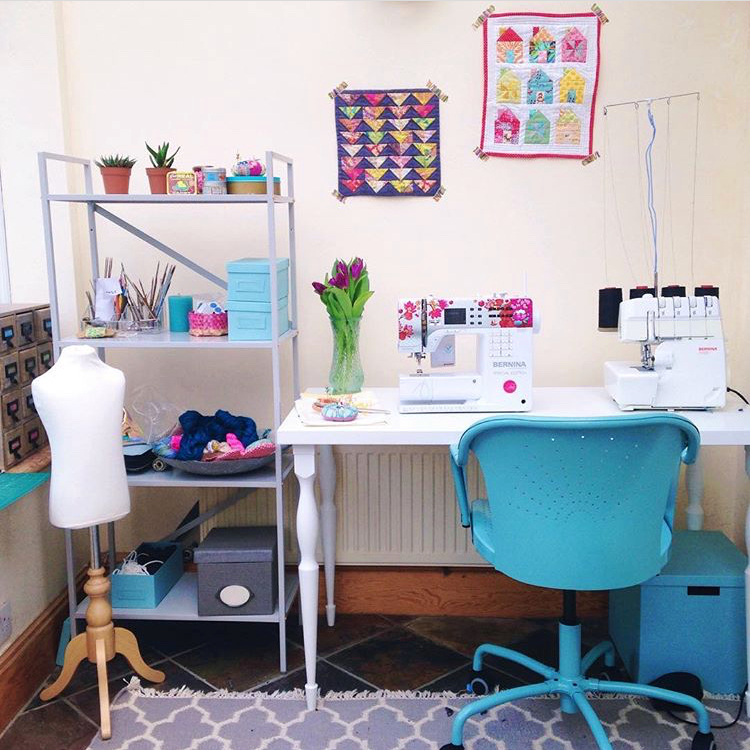 I hope you enjoyed my sewing room makeover. Thanks to Block Design for kindly providing products from their beautiful range. 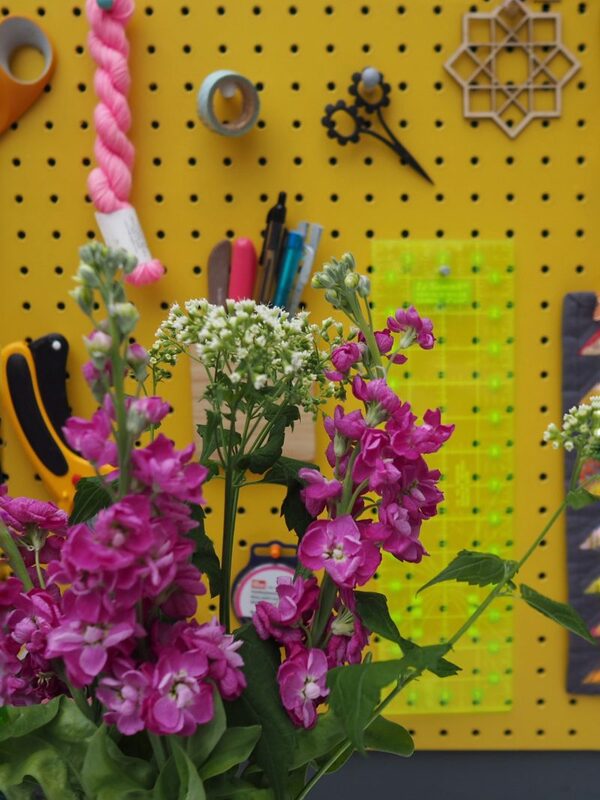 They have also sponsored a giveaway in which you can win a medium pegboard in the colour of your choice and a small clipboard. To enter, please leave a comment below (I will need to be able to contact you so please make sure you provide your email or social media handle!). For more entries, you can also follow me on Instagram and leave a comment under the giveaway post. The competition will close at midnight on 10th June 2018 and the winner will be announced shortly afterwards. This competition is for UK residents only. 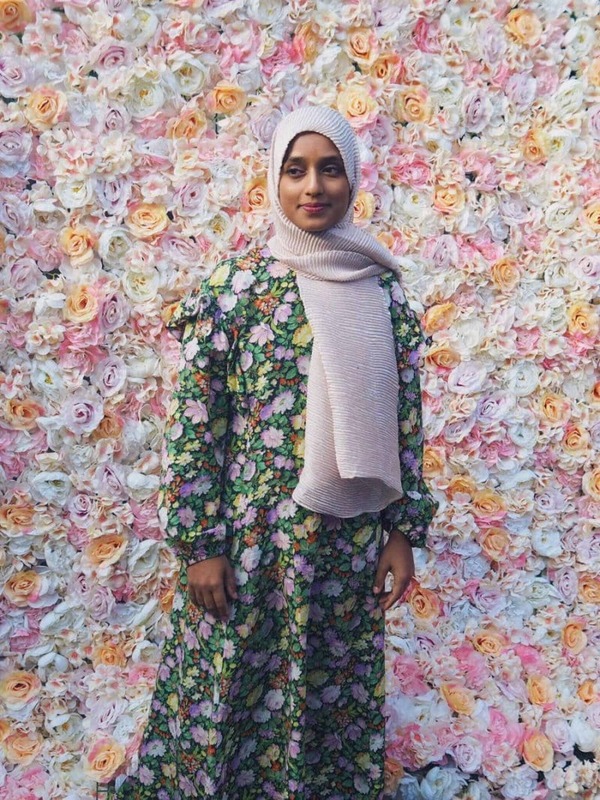 Such a great article and your room looks gorgeous. 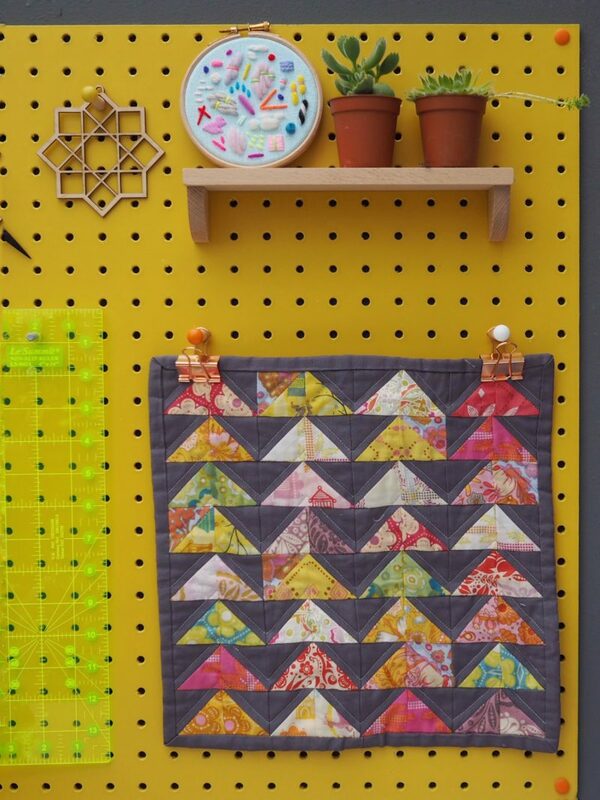 My daughter has requested this pegboard for her birthday but I think I’d like one too! Hi! 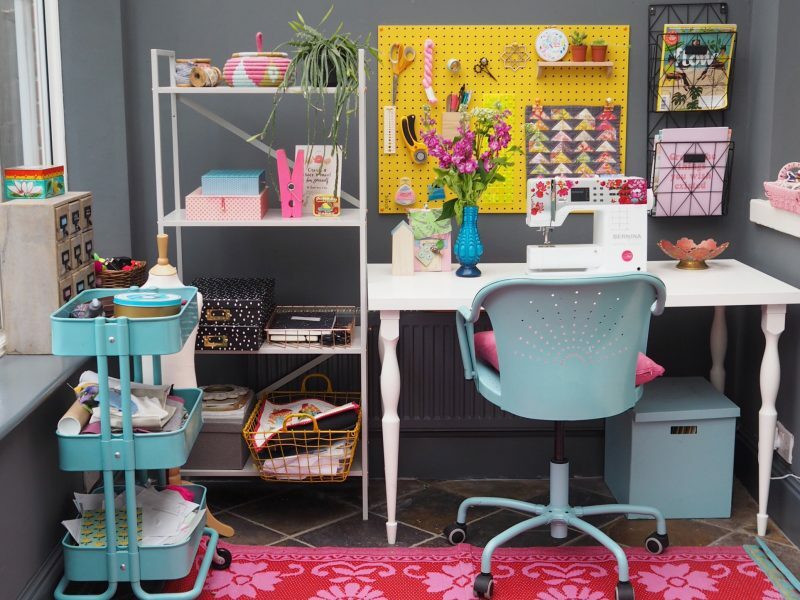 Your sewing room makeover looks beautiful. Thanks for the intro to Block Design. I had been also looking to re-do my sewing area and their products definitely add more style. wow love how the room turned out , love all the colours 😍😍👌🏽👌🏽.